I've found a few OM lenses for a good price and I wonder if contrast loss could be a problem when using them on 4/3 cameras? Sometime in the past I saw people put a black baffle to the back of the lens (like the Hexanon 40mm f/1.8) and the result improved dramatically. Is there anyway to know how the optimal size of the inner hole? Should it be a function of the focal length, sensor size and flange-back distance, or am I missing something? In general contrast loss with legacy lenses is not a problem. If you look at a ray trace from a typical lens you'll find that, though the light cones converge to points on the sensor, they emerge equally from all parts of the rear element of the lens. A naïve baffle, right up next to this element, is as likely to reduce the desired light reaching the sensor, causing vignetting, as improve contrast. An ideal baffle would lie directly over the sensor, similar to how the mirror box lies. An ideal baffle would reflect no light itself, but there is no reason to assume that construction paper is "more black" than the mirror box. BTW, there seems to be a meme going around that large rear elements are a fundamental issue on fourthirds. This is ironic, since 3-4 years ago the meme was reversed. Neither is entirely correct, though the current meme is less correct. Geeze, Acme. That's just what I was gonna say. Canon bodies. L, OM, and Zeiss glass. FWIW, I use 25 mm-diameter black cardboard baffles in my adapters for long telephoto lenses and it does indeed improve the contrast noticeably. However, a long hood that covers the AOV, as seen by the 4/3 sensor, should have the same effect. However, I have stopped using a baffle with short focal lengths (<50 mm) because it acted as a restricting aperture when using my OMZ 50/1.2, effectively making it an f/1.8. For short focal length lenses slower than say f/3.5, the baffle is almost pointless because the rear element (or rather the exit pupil) is so small that almost all light pass through the baffle anyway. I do believe though that there is a real benefit in improving the contrast for short lenses with apertures roughly (depends on focal lenth) in the range f/1.8-f/3.6. Because I want to use the same adapter for many lenses, I have started using hoods that fit the AOV with each lens on 4/3 as snugly as possible (e.g., an hood for an OMZ 100 mm on my 50 mm lenses). That does the same thing. Hi all. This topic made me register on this site and this is my first post. I think the responders who have not “noticed any loss of quality” (good for them!) are missing the point about baffles. It just so happens that baffles DO improve image quality with legacy lenses tremendously. In addition to contrast, they improve image sharpness and reduce chromatic aberration. Those interested will find lots of relevant examples and discussions on the web. About the vignetting supposedly produced by “naïve baffles”, please note that the point, among others, of figuring the right diameter of a baffle is precisely to avoid vignetting. There is a very wide room for manoeuvre before the problem of vignetting would arise in any case, because legacy lenses were designed to operate on a full-frame 35mm camera and cover an area on film that is double the size of a 4/3 sensor. Given the large diameter of the rear optical element (and the sensor’s relatively small size), much of the light coming into the mirror box is peripheral and either does not land on the sensor to begin with or hits it at a very sharp angle and is reflected by the sensor’s highly polished surface back onto the rear lens element. As a result, the mirror chamber fills with superfluous and straying light which is due entirely and exclusively to the fact that the coverage of the lens mounted on the body was meant for a much larger chamber. The point of the baffle is to be rid of this redundant light. Masking part of a lens’ rear lens element does indeed reduce the amount of light entering the mirror chamber, but it is easy to see by placing baffles with progressively smaller centre openings on the lens and checking exposure values as you go that you can go a very long way before the camera’s light meter even detects any light falloff. Ideally, the right size of the baffle for that given lens is just before you reach this point. The info above comes from the site of Christophe Esperado – a fine baffling connoisseur – where you can find detailed instructions as well as Before and After images showing the results: http://www.esperado.fr/fr/objectif_m...en_format.html. You will also note on that site that Hexanons can also be provided with focus confirmation circuitry (Dandelion), a real boon given the peep-hole quality of most 4/3 viewfinders. It's possible that this discussion is running into a terminology issue more than a technical issue. What is generally meant by the term "baffle" is a mechanical vane within a lens that either absorbs or redirects extraneous light such that it doesn't contaminate an image. The key word there is "extraneous" - a baffle must not block light that would be focused upon the sensor. If a baffle does block such light, it's not really a baffle at all, but rather a stop. Now - stopping down a lens - here we have a completely different topic. There are lots of reasons why we might want to do this, even if the stop is so placed that the lens vignettes rather than stops down uniformly over the frame. For a simple example, hold a pencil up in front of your eyes such that the writing on it is just a bit too close to focus on. Now squint your eyes - the focus gets better, although a lot of light is discarded. Your eyelids are working as a stop. Something very similar is happening to one of Christophe's example images, where he is very clearly reducing the Spherical Aberration of his lens by introducing a stop. 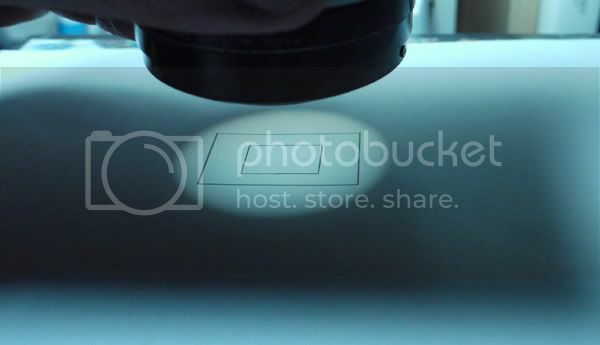 If the photographer is lucky, and the lens allows it, he can place most of the vignetting such a stop introduces just outside of the imaging area of his sensor. He we can have the best of both worlds - severe mechanical vignetting will only be present on 135 (35mm) format, while some benefits of that vignetting, in reduced SA/LA may appear on 4/3" format. There will even be a tiny range here where a true baffle can exist, removing veiling flare while not preventing even a single focused ray from landing on the sensor. This is a rare circumstance, however, and finding its exact location will take a lot of trial and error. Its effects will be uniform and subtle, having no influence on fundamental optical aberrations. Unless it's very black it will be inferior to the mirror box in this task. When advice is talking about losing "less than half a stop" of light, we have long since left the realm of designing a baffle, and are solidly in stop territory. I am quite surprised that terminology should be an issue here, as I have always (since the middle 1970s) known the black matte surface surrounding the rear optical element on a lens as a baffle. Furthermore, I have always understood its purpose as being exactly what we (or I, at the very least) are talking about: eliminating stray reflections inside the mirror chamber. Granted, as it is located behind the rear lens element and not around it, it can’t help but act like a “stop”, a fixed aperture device, or squinting eyes for that mater (I do understand how a diaphragm works). None of the above actually addresses the issue of whether the presence of such a baffle/stop is desirable or not, however. If I understood you correctly, you originally suggested that all light rays coming from the rear lens element, even those that come from its very edge, need to reach the sensor (are they truly "focused" on it?) and that a baffle/stop leads to vignetting while its effects on image quality are questionable, if not dubious. Given that my experience (not to mention Christophe's) clearly shows that you can reduce the diameter of the baffle/stop’s central opening considerably before the image even begins to darken, where do you see the vignetting? In the event, since the disappearance of this peripheral light rays can't even be discerned with the naked eye, what can possibly be its significance for image quality? Are they even there (on the sensor, that is)? How are we to explain that a lens with a 26mm rear lens element at full aperture and the same lens sporting a baffle/stop with a 16mm hole in the middle both produce the same EV, all other factors being equal? The answer that seems obvious to me is that the rays stopped by the baffle/stop don’t land on the sensor to begin with. If you have an alternate explanation, I would like to know what it is. What is clear to me, is that the presence of the baffle/stop on the lens improves image quality dramatically in most cases. The absence of light falloff also suggests to me that the improvement in image quality is not due to an optical phenomenon similar to that which is usually induced by stopping down a lens but rather to the elimination of stray light. I've experimented with baffles behind the rear element. The size is important, and making the hole too small can reduce the aperture, as has already been mentioned. My understanding as to ONE reason why this works to improve contrast, has to do with restricting the light from the edges of the lens(the very large elements of F1.2 & F1.4 lenses) so that it doesn't reflect back off the sensor, then off the back element and back to the sensor again. These are very interesting & useful advices. I'm planning on making a baffle for my OM 135mm f/2.8, because the result I get with it (wide open, of course) is not really promising. I've seen better result with other 135mm and wonder why I can't achieve the same with this Zuiko. I'll do some experiment with the baffle size and report the result. Terminology is an issue because without it there is no shared method of describing something. What you understand to be a baffle could at various points within an average lens be any of a baffle, a stop, or a mechanical component. It could be, and usually will be, two of these things at once. My original description was unclear, but to clarify it I will have to add some more terminology. As I've suggested, we're not really dealing with baffles here, but rather stops. What I've failed to describe is the difference between baffles, aperture stops, field stops, and things in between. Almost all photographers have experience manipulating aperture stops, but few really understand how they work. My own understanding is only basic, but fundamentally an aperture stop lies at a position within a lens where it can intersect all of the light cones (pencils) uniformly, narrowing them versus the wide open condition. This has the effect of evenly darkening the image, essentially producing a lens with a smaller major diameter. Likewise, all photographers have experience with field stops, but few consider them closely. A field stop lies at such a point that it intersects only a portion of the light cones, passing others unaffected. This has the effect of trimming away such light as was not going to be focused upon the sensor, while taking care, by size and position, not to affect the light that would be so focused. The "petal" lens hood of a wide is a classic example of such a stop, while longs must usually create this stop deeper inside the lens. Another place to locate a field stop is directly around the sensor. The ideal stop in this position would be a truncated pyramid of blackened razor blades, such that light that fell outside of the sensor would be redirected sideways to be absorbed by some other really black stuff. At first glance, a camera mirror box seems like the exact opposite of this, with sides, though blackened, angled to steer any light that does reflect off them down onto the sensor. It is not so. Close examination of a mirror box will reveal numerous baffles, designed to redirect any light that does reflect off them either up onto the (also black) rear of the lens, or even up all the way through the lens and back out into the world. Mirror box design is best observed by looking out from the back of a film SLR. Furthermore, there are places within a lens where an occlusion will act in part as a field stop, and in part as an aperture stop, because it can neither intersect the light cones in such a way as to uniformly reduce their steepness, nor in such a way as to reduce their number. This kind of stop will introduce (mechanical) vignetting by occluding more of the light cones toward the edge of the field. I'm not going to describe the relationship with geometric distortion, but it's something to google. Mechanical vignetting is sometimes deliberately introduced by a desinger, who adds an obstruction to lessen a stubborn aberration when a purely optical correction would be prohibitive. But a baffle that introduces mechanical vignetting is a design error. Unlike stops, baffles do not have a direct effect on the optical path. They are sized and positioned so as not impinge on the light that was let through by the field stop. If you like, you can think of the field stop as the chief baffle. It's got the ideal spot to do its necessary work, but, because their position in the optical path is not ideal, all the other baffles have to be very careful to keep their grubby fingers out of its fresh paint. A small enough occlusion around the rear element of a lens will not vignette it enough to be noticeable, but such an occlusion will only occasionally accomplish anything useful. It will far more commonly add flare, by being less black than the mirror box. How are we to explain that a scratch or black spot on the rear element of a lens does not automatically result in a dark spot in our images? The answer is that all the light cones emerge in part from all of the rear element. Even those cones that converge near the centre of the image emerge in part from the edges of that rear element. How are we to explain, as you and Christophe suggest, that the addition of a rear obstruction can reduce Chromatic Aberration (or, more obviously, Spherical Aberration, as I noted previously), without producing any light loss? These are fundamental aberrations, not flare. Their removal by this method cannot help but discard some desireable light as well. Of course even aberrations count toward exposure, but if we happened to add some really black stuff in just the right place to reduce flare only, we would still reduce the EV. I'm afraid there is no basis to your question. Well don't get me wrong - I'm all for stopping down a poorly performing lens. Or for doing something less than stopping it down, by introducing some mechanical vignetting. But don't oversell your gambit; if it's doing anything significant at all, that obstruction over the rear element of the typical lens is reducing the amount of light the lens was capable of focusing upon the sensor. In this case it's not about stopping down. This is focusing on a 4/3 sensor not a Full Frame sensor. The baffle is to block unwanted light from producing unwanted reflections which reduce contrast. For example, here is a Canon FL 58mm F1.2 lens. 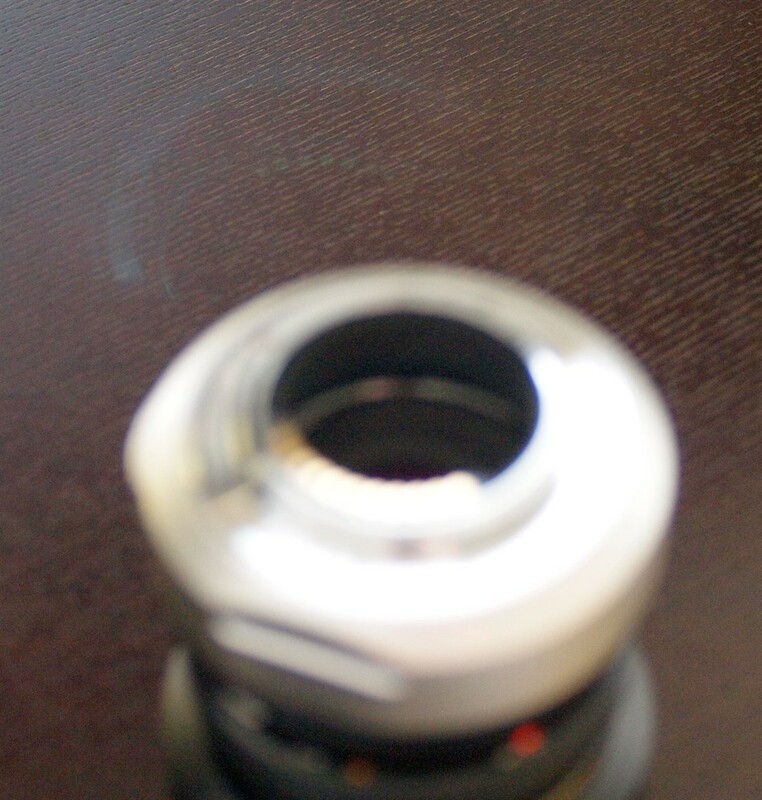 The back lens element has a diameter of 32mm. I covered the front of the lens with translucent plastic, to diffuse the light evenly over the whole image. You can see that the image circle is larger than the FF (35mm film) rectangle. The image circle is the same size, but the circle is more than two stops dimmer. 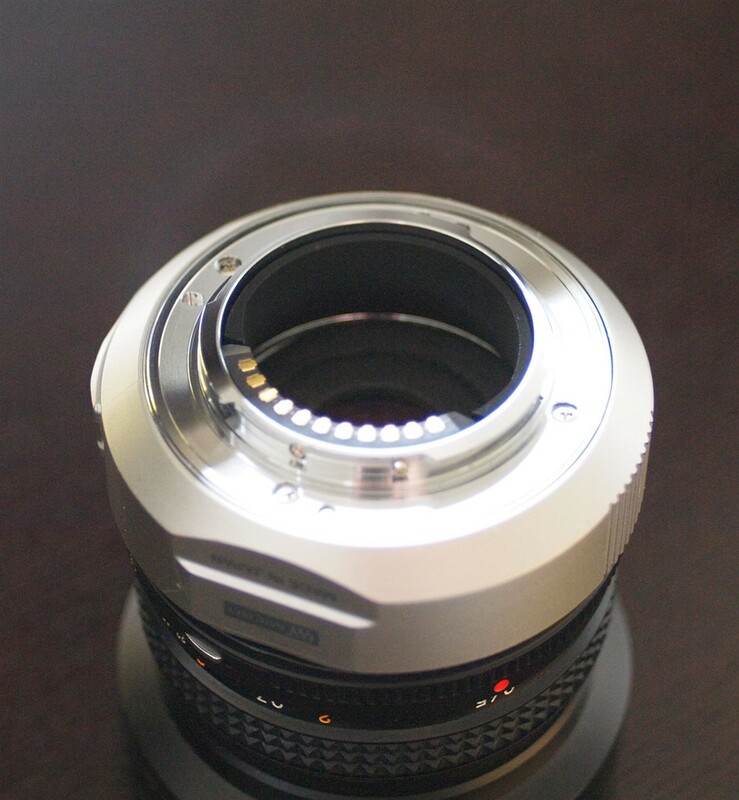 Now here is the lens at F1.2, but with a baffle across the back element, diameter of 20mm. This is 40% of the area of the rear element. If the baffle reduced the light falling onto the 4/3 sensor, then the reduction in F-stop would be around 1.3 stops, giving a dimmer light on the sensor. This is why the baffles improve contrast without reducing F-stop, because it reduces the amount of unwanted light around the sensor from reflecting around the inside of the camera. Only the image circle is altered, and this image circle is perfect for a 4/3 sensor. There is nothing wrong with your demonstration, but there are problems with your conclusions. Foremost is that the obstruction on the rear of the lens is more effective at trapping light than the mirror box. Without specialized materials (construction paper is not), this is unlikely to be the case. If this is not the case, then an obstruction will only add to flare, not reduce it. Secondarily, you incorrectly assume that the introduced mechanical vignetting that begins within the 135-format circle, does not continue into the 4/3"-format circle. In the wide open condition, the vignetting this lens shows even on 135 format is quite reasonable - even without rigorous testing, I can see that it's fairly flatly illuminated. We can assume there is essentially zero vignetting in the 4/3" circle in this condition. In the obstructed condition, the vignetting on 135 format is beyond severe. I could make a guess at 4-5 stops, based on the central spot being nearly saturated, while the corners are nearly black, with a smooth gradient (due to the suboptimal placement of the obstruction) in between. From this basis, we can conclude that the vignetting on 4/3" has gone from essentially zero to somewhere around 2 stops on the corners. Now, we all know that many lens aberrations reduce when we stop a lens down. In particular, spherical aberration, coma, and axial chromatic aberration typically reduce. It is the clipping of these aberrations, by the introduced mechanical vignetting, that, if anything, is improving the performance of the lens. BTW, for further entertainment you might try stopping the lens down while it remains in the obstructed condition. The higher the f/ratio, the narrower the light cones and the more that rear obstruction will indeed perform like a true baffle, vignetting less. But it will still need to be made of really black stuff to trap more light than the mirror box does. What is the diameter of the image circle of a legacy lens on the plane of a 4:3 sensor? Is it the same as it is on the film plane? Comments/criticisms are just my personal opinion and are meant to be constructive. Please feel free to do the same for me. Yes, it's the same because that's where the lens is designed to focus. The image circle is around 52-54mm. I've done some further tests, this time taking images USING the lens on a G1. With a 20mm baffle, there is some vignetting. Maybe 2 stops in the corner, is about right. With a 24mm baffle, the vignetting is close enough to the original to be not significant in the field. "that obstruction over the rear element of the typical lens is reducing the amount of light the lens was capable of focusing upon the sensor." Based on the exposure for the wide open, and two baffle sizes, the obstruction over the rear element of the lens didn't reduce the amount of light the lens was capable of focusing upon the sensor, provided that the baffle is not too small. Yes, it affects the amount of vignetting. So I can adjust the size of baffles by taking test shots, and choosing the size that doesn't produce too much vignetting. So far as the effectiveness of the baffle is concerned, I don't have photos on hand but I believe that the baffles DO improve contrast. If you take the first shot, you can see that maybe 85% of the light from the image circle doesn't hit the 4/3 sensor. This means that it's free to reflect/scatter back towards the rear element of the lens, and then reflect back onto the sensor. This is one reason why modern lenses have improved rear element coatings. With the baffle shown, much less light is reflected back. Last edited by dnas; 05-07-2010 at 05:21 PM. Okay, I'm not exactly comfortable with the theory here, but would like to point out something: there are lenses with HUGE image circles that perform admirably. Think large format, with tilts and swings -- I have a 90mm Schnieder that can paint a 4"x5" plate when shifted half the size of the plate, or tilted 15 degrees. Those suckers light up a huge cone, and yet seem to be sharp and contrasty. Think OM Zuiko 24mm f3.5 shift -- that guy lights up a circle that must be at least three times the area of a 35mm frame, and yet is sharp and contrasty wide-open. And yet, I intuitively agree that excess light bouncing around in there can't be good... and yet, it happens, and seems to have little affect, at least on the examples cited. So I'm suffering from intuitive dissonance on this issue. But when theory collides with practice, I take practice every time! I use deep lens hoods suited to the focal length's FoV on FourThirds format. I've seen no difficulties with flare or other issues with the Konica 40mm, the various Nikkor and Pentax and Olympus 17, 20, 24, 28, 50, 70, 105, 135, or 180 mm lenses I've used. If the light can't get to the lens and ray trace to the edge of the sensor box where it might reflect, there's nothing to cause flare. I've seen cases with 90mm lenses on 4x5 were there was severe image degradation due to internal reflections, most often from the inside walls of the rear standard but sometimes from the bellows itself. This is way almost all premium 4x5 system cameras offered a compendium hood (one that has a rise/fall & shift abiltiy). I'm preparing to do some work on a Fotodiox K-to-m43 adapter this weekend. I've found that I get very good results from my 50mm f/2.0, but my 100mm f/4 Macro is problematic. Sometimes there is extreme flare. After a little examination it became clear that the inside wall of the rear flange, while very black, is extremely shiny. Its quite obvious that this part of the adapter needs to be matte black and perhaps a baffle needs to be added at the rear of the wider part of the adpater tube to prevent light from striking this portion of the adapter. How much this internal adapter flare (analogous to "bellows flare" in a view camera) seen depends tremendously on the particular lens attached. The Pentax-M 100mm f/4 Macro is an issue largely because of its optical design (rear element is way forward in the barrel and because it focuses by pure mechanical extension. The latter means that at 1:2 it is trying to cover way more than a 35mm FF image. The barrel's internal baffling works well for its designed coverage, but spills a lot of light on the inner walls of the adapter. My 50 seems to be much less of an issue (I've yet to detect any contrast lost to flare), likely because the rear element is so much closer to the problem portion of the adapter altering the angle the extra light strikes. UPDATE: After some experimenting I've settled on a 20mm baffle made at the very rear of the adapter. I've also lined the inner wall of the protruding mounting flange with matte black felt. This seems to have completely cured the flare issues with the 100mm f/4 Macro and works fine with the 50mm f/2.0. First, apologize for my poor English, and thanks for your interest about my article concerning baffles. Just two little things to add : Because each photodiode in the sensor is surrounded by microlenses with a little effective cone in order to concentrate the photons on the photosite, light coming from important angles (edge of large lenses) will not reach the photodiode anyway (the Olympus "telecentric"). On the contrary to the film witch can be illuminated under any angle. That is the reason you can discover that your f:1.2 lenses is not so luminous on your four third sensor than you expected first, even without any baffle. So, cutting with a baffle the light coming from the edge of the lens outside this angle will not, in fact, make change in the real sensitivity and you will not loose EV on your 4/3 sensor. But it will increase sharpness, because most of the optical distortions comes from the edges of the lenses. On my Hexanon 57mm f:1.2, the 24mm baffle covers near half of the surface of the back lens, with only little loss of light and a very noticeable improvement. If the baffle is near the lens, it will act more or less as an aperture, cut the light from the edges of the lens and will improve the sharpness. The place they are on my Hexanons gives-me a good compromise. So, i believe that the users of µ4/3 will have to take care their baffle to be near the lens and not on the back of the adapter. If your adapter is not enough matte, better to paint-it in matte black or cover-it inside with some appropriate matte material (thin velvet). All is a matter of testing: two many unknown factors in your lenses and sensors for loosing time with theorization. For those who not believe, and specially acme, did-you see any excessive vignetting on all the tested lenses at all apertures on Street-photo.fr site, all done with baffles (size indicated) and no post-prod vignetting compensations ? I dislike to read controversial argues about the material in witch baffles are made. Black thin cardboard mat paper is just easy, but you can do with any material, as long it is deep black and don't shine. Anyway, the light cut by the baffle will not reflect in the chamber or so few with second reflection on the back side of the lens witch will be... hidden by the baffle, and, from the sensor point of view, the baffle will not be as reflective anyway than the back coating of the lens. The thickness is not an event, because at this aperture size, no diffraction can occur. Because i believe in experience, i've made comparison baffles with the better absorbing materialfrom an old chamber: no noticeable difference. Don't worry about. And, as i said, a litle level of light in the chamber is sometimes positive with shadows details reproduction. The result varies with each lens but i find the improvement from good to impressive on the sharpness point of view, except with my macro Hexanon 55mm lens, with his original rectangular baffle from Konica. In fact, i had made an circular baffle on it just to improve circular bokeh. To conclude, the two 100 % crops you can see in my article where made this way: crop of the center of two images, with and without baffle, on a tripod, focusing best as possible with liveview X10 at full aperture, and same postproduction process. I will publish similar comparative pictures with other lenses as soon i got time to do it. BTW: Thanks dnas for the very nice and clear images you made. Did-you agree if i add them to my article with credits if you like, to explain better how baffle works ? Last edited by Esperado; 11-26-2010 at 09:11 PM. This conversation, while technically excellent, well-written and succinct, has left me ... baffled. Seriously: I have an ancient Nikon 200 f4 that works fairly well wide-open and with short exposure times, but head into multiple-second exposures or, even worse, put an IR filter and take those exposures into 10s of seconds, and all photographs are screwed up due to internal reflections in the mirror box (4/3, E510 and E30). Completely unusable and I imagine that it is due to both optical and metal reflectivity, operating under an environment that the manufacturer never, ever contemplated...which is okay. How could they? Reflexions are proportionnal to the light at the output of the lens, so their amount will stay at the same pourcent of the direct light reaching the sensor whatever the exposure time. It would be better to look for the cause of your problems in a lack of lightproofness of your mount ? Last edited by Esperado; 11-27-2010 at 02:32 PM. Thank you for you generosity! At this forum, you share us so important message.I like this kind of post which tell us much important massage.thank you again. HI Did anyone tried to convert their 40mm 1.8 pancake lens using these baffle sizes? I tired to convert mine, without putting shims in the lens, the lens will hit the baffle when focused to infinity. Does anyone have a solution to that? Do I have to put shimi in the lens to eliminate that problem? Also did anyone make the change for focus to infinity? I tried to read the page in the link provided below, but I don't understand French and google translator doesn't seem to be bale to translate the page accurate enough for iterpreting in Eng. Can anyone shine me some light? Thanks. Loving the forum guys...holiday for me ! Hi All, just recently acquired the E-P2 and noticed this phenomenon (pic attached) and did a search here. It was a good read but can anybody advise will the reflection be reduced if i add a baffle to the OM adapter instead of the lens? If so what would be the recommended diameter? Also does the diameter change when using different focal length? I didn't have any problems with the OMs when using it on my E3 and they were all very good performing.